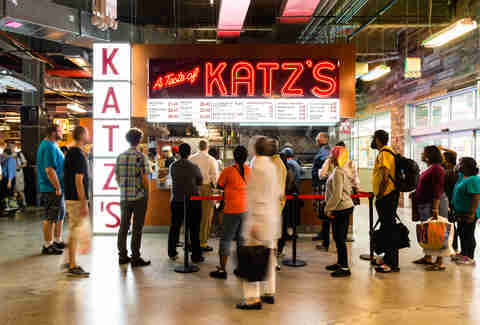 Step in line at A Taste of Katz’s in Brooklyn’s new DeKalb Market Hall behind a gaggle of shoppers lugging their weight in Century 21 bags and place your order at the counter. Unlike the original kosher-style Jewish deli (which has been in operation since 1888), you won't need a ticket here. The original Katz’s has occupied the corner of East Houston and Ludlow Street on the Lower East Side since 1917, with everyone from Midwestern tourists to local deli lovers lining up to spend some time among the clamor of clinking plates and wafting scents of fresh-carved meat. But after 129 years slinging mountain-high pastrami on rye, corned beef sandwiches, matzo ball soup, and knockwurst with beans, Katz’s has made the decision to expand, with its first-ever non-OG location inside Brooklyn’s buzziest new food hall. There’s certainly a lot of the deli’s defining characteristics missing at the new stand. Part of the excitement of the original Katz’s is the ordering system -- taking your ticket, getting in line at the counter, chatting with the carver about the particulars of your order (and maybe even getting a sample in the process), and absolutely, under no conditions, losing your ticket. At the new Katz’s, things are far simpler (and less personal): sans tickets, customers peruse the menu board, place an order, and wait to pick it up from a nearby window, like at most fast-casual restaurants. You can still watch the pros whittle slabs of pastrami and corned beef into slices, but there’s far less opportunity for banter (and samples). There are no photos and testimonials of Billy Crystal, Meg Ryan, and Bill Clinton hanging on the walls (there are no walls!). There’s no nostalgia from countless film scenes filmed at the tables and late-nights hunched over Reubens and Cel-Ray sodas and beers. The place isn’t 24 hours, either -- DeKalb Market closes at 9pm on weeknights and 10pm on weekends. Seating is extremely limited, so chances are you’ll have to take your meal home, or eat awkwardly in a crowded mall. Still, the food is every bit as good as it is at the original. 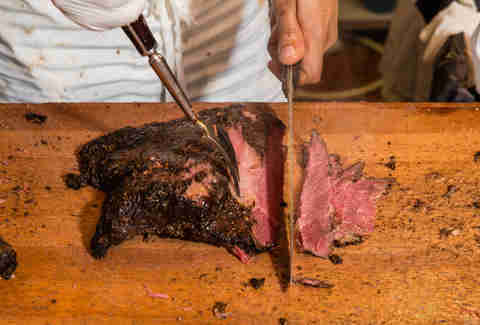 Just like at the Lower East Side store, the famed pastrami is cured and rubbed in a spice blend that includes onion, garlic, pepper, and coriander (the specifics are closely guarded secret), gently smoked for a few days over wood chips, boiled until supple, steamed until even more tender, then sliced to order and piled in a precariously tall tower, kept in place with two slices of rye bread. Hot dogs are snappy and super flavorful. Latkes are golden, crispy, and just greasy enough. Baseball-sized matzo balls swim in rich dill-scented chicken stock. The menu is slightly abbreviated, but it’s got the classics. And the prices are the same as Manhattan, too -- $21.45 for a pastrami on rye, which anyone who's eyed the staggering size before knows is a pretty fair sum. 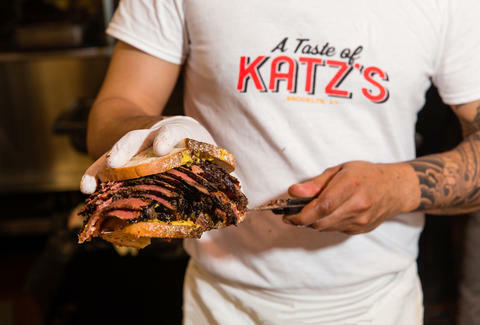 If you’re craving a serious pastrami sandwich with a shorter wait and no fuss, head to Brooklyn; but if it’s the true Katz’s experience you’re looking for, stick with the original.